Around 2 p.m. (EST) today, an event happened at a middle school in Springfield, Mass. The details were sketchy at first, as they often are in the first few minutes. Just seconds after this tweet, some of @Breakingnewson’s followers started retweeting that note. Who wouldn’t? This sounds like Columbine, right? Within minutes, it had been retweeted dozens of times. It appears that @Breakingnewson was using WWLP as its source for the original tweet. 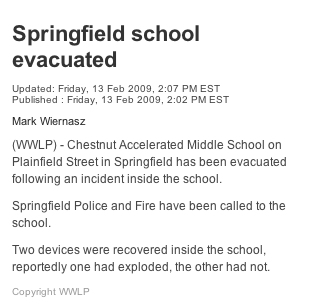 When you read WWLP’s original note, would you immediately conclude the school was “rocked” by an explosion? That sounds more measured, and it shows now that @Breakingnewson was using WWLP as a source. 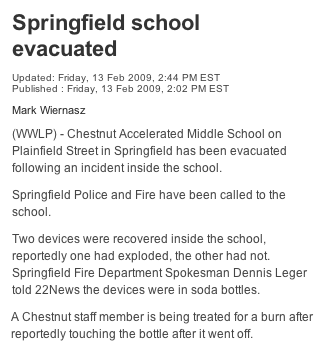 Exploding soda bottles and someone getting burned are nothing to laugh about, but was the school “rocked?” (It turns out the injured man had minor burns on his hand, according to WLLP). The TV station is now reporting that two 8th-grade boys are being questioned, the school has returned to normal, and class was being dismissed at regular time today. Twitter is fast, and it is viral. News organizations on Twitter still need to use news judgment and restraint. These tweets, which were likely seen by thousands of people, are taken as fact by a lot of people. If you’re a journalist on Twitter, be careful about what you do. Take a deep breath before you report something is “rocked” by an exploding Coke bottle. I did not receive a repsonse to my email, but Michael van Poppel of @Breakingnewson has commented below. This is why I won't follow @breakingnewson. I saw the reports — but saw the more accurate reports from people I follow on Twitter. Know what you're tweeting, and if a correction is needed, do so immediately. I watched the exact same phenomenon from @breakingnewson about the Oklahoma tornadoes. I'll still follow but would verify anything @breakingnewson posts. That's not to say it isn't a great service, they just need to invoke some old fashioned editorial control, standards and rigour. I've lost count of how many almost-but-quite tsunami warnings the service has pumped out. One trick they miss – and perhaps this is on purpose – is not linking out to their sources. Your article seems to strongly suggest that BNO News used the information from WWLP-TV, which is not accurate and I believe you should have contacted us first before making assumptions. However, as you may well know as a journalist, information is extremely sketchy when a news story breaks and some details may be inaccurate at first. BNO News received information from several sources, including from emergency scanner traffic and the Springfield Fire Department. This information was the reason for our bulletin stating that an explosion had “rocked” the school. If this is correct, I am not sure but witnesses may have experienced it like this which lead to this report. BNO News was not aware of the WWLP-TV article when the first update was posted to our website. After we read the WWLP-TV article, we provided this information to our readers. Shortly after, a spokesman for the Springfield Fire Department briefed us on what was happening and we also provided this information in our article. In addition to this, to the comments below, I don't feel there were any mistakes in our reporting. While this story didn't warrant a “bulletin” (an alert in all-caps), there were no inaccurate updates and updates were provided as soon as we had them. Regarding the tsunami warnings, they are rare and when BNO says there is a tsunami warning, it is accurate. We would never post a tsunami alert when there is none. You may be confused by the posts that say a tsunami warning center is the source for earthquake information. Tsunami warning centers issue alerts on strong earthquakes and when an update ends with this for example: “- tsunami warning center”, it means it is the source for the information. It does not apply a tsunami warning was issue. Our updates would let you know if a tsunami warning was actually issued. Again, our contact information is clear and this blog should have contacted us first before making assumptions without checking the facts. Would be interested to hear other thoughts on this topic. How much attribution should tweets have? Thanks for the comment. I sent you an e-mail yesterday looking for your comment, but did not receive a reply in e-mail. Not sure why (if you did send one). In either case, I'm glad you posted here. You didn't divulge nor link to your source in your bulletin. Yet you mentioned WWLP-TV early on. I said that iit “appears” you were using WWLP as your source. I appreciate you clearing that up, and you're right: I should have contacted you to ask you on that point. I do find it interesting that you got information from the Springfield Fire Department, but didn't attribute it to them. If your original bulletin said the explosion “rocked the school, according to Springfield fire officials (or according to Springfield emergency officials,” at least the reader would know you're just reporting what you're hearing, not overblowing a situation yourselves. The original source you used, however, does not change the message of my blog. You're right: as a journalist, I know initial information can be sketchy. Therefore, I err on the side of caution. Twitter, as I said, is a quick, viral medium. We (as journalists) should be careful posting sketchy information as fact, and we should attribute any information when possible. That's my advice to anyone posting news on Twitter (or any other medium). We think @Breakingnewson is a very interesting new media creation, and we'd be very interested in giving you a chance to say more about how news decisions are made. We do occasional Q&As with media newsmakers. We invite you to do one for us, if you're game. There should be an acknowledgement of, if not a link to, the source. Period. Agreed wholeheartedly. The couple of times they've use my organization as source material, no link or attribution has been use, which they told me is their standard procedure. To me, that's nothing more than content theft bordering on irresponsible use. The service they provide has the potential to be a great use to the community, but clarity and honesty are suffering for their current model. Is that you, Craig? If it is, I'm glad to see the Sun-Times get in on the action! explosives are really dangerous especially when mistakenly used, this explosive can cause total damage or sometimes it can cause death, that's why it is prohibited in using. Wow! That news is quite alarming. But I don't know which one to believe for it has lots of versions.